Re302 S414 Fire Control Post [PDT] for Bat. 'Graff Spee'. 1 x Flakstellung 2cm Flak28. After the attack on the lock gate at St Nazaire the defence was again increased. 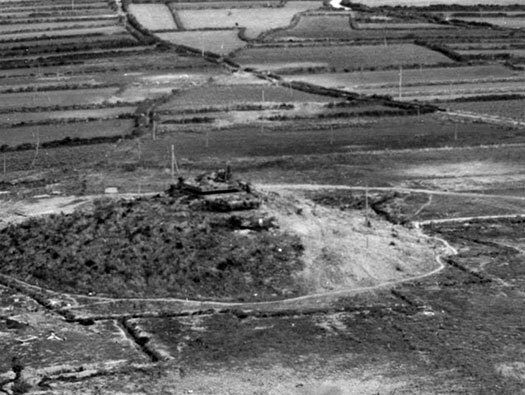 A batterie of four 28.0cm SKL/40 guns were placed in three open emplacements and one in a large casemate. These guns were targeted from a very large fire control post (PDT). A contemporary view of the post. Plan of the area showing where Re302 is forward of Re303 the batterie. Re302 S414 Fire Control Post [PDT] for Bat. 'Graff Spee'. Pointe St-Mathieu. We parked in the car park at the Abbey and walked the Abbey, Vauban fort and a small battery of French guns red arrow. 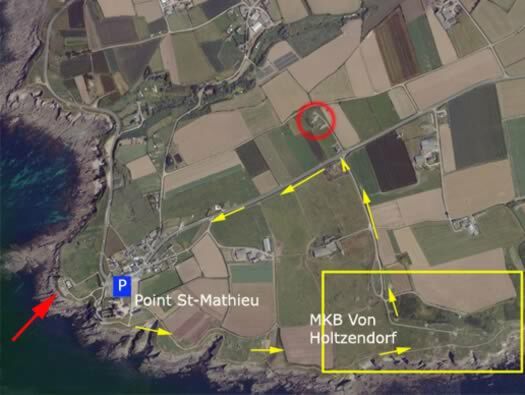 Then we walked the yellow arrows along the coast path, finding several gun positions, search lights, AA battery and MKB Von Holtzendorf. Continuing inland you came upon the large fire control post (PDT) for Bat. 'Graff Spee'. 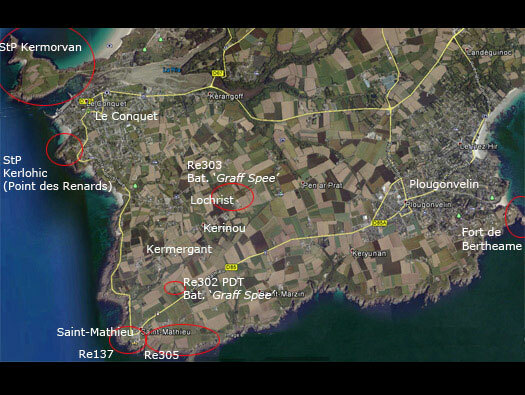 Defence pf Brest file HQ 29th Inf. Div. 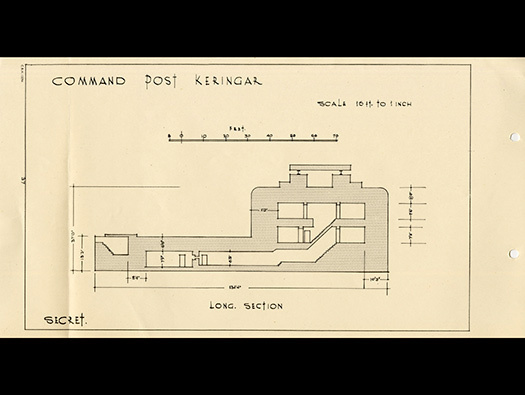 Defence pf Brest file HQ 29th Inf. Div. panflet. Re302 S414 Fire Control Post [PDT] for Bat. 'Graff Spee'..
Re302 S414 Fire Control Post [PDT] for Bat. 'Graff Spee'. Plan of an S414. 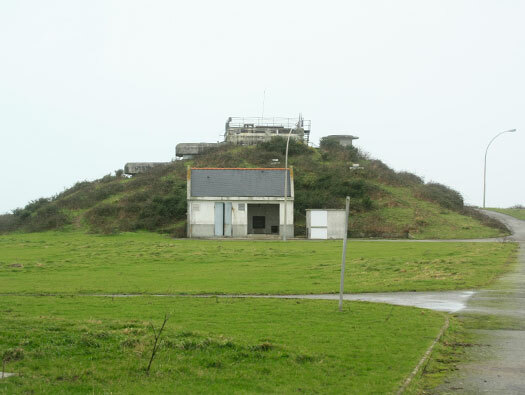 Built on several levels with rangefinder, two observation, computing, telephone exchange, wireless, ventilation rooms plus not shown here an extra M151 Quarters bunker. Inside another type of FCP. Re302 S414 Fire Control Post [PDT] 'Graff Spee'. This picture shows the attempts at camouflage. S414 Fire Control Post [PDT] 'Graff Spee'. 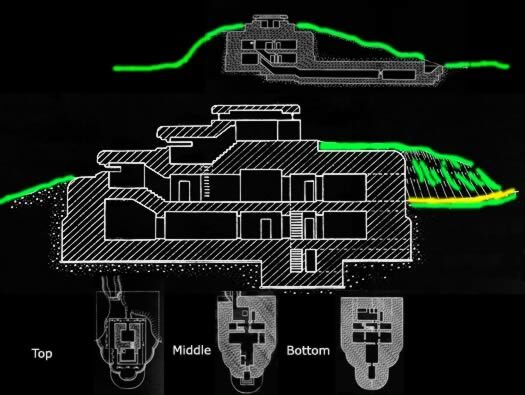 Plan of the S414 with an attached M151 bunker under the gray/white French building (that looks like toilets). 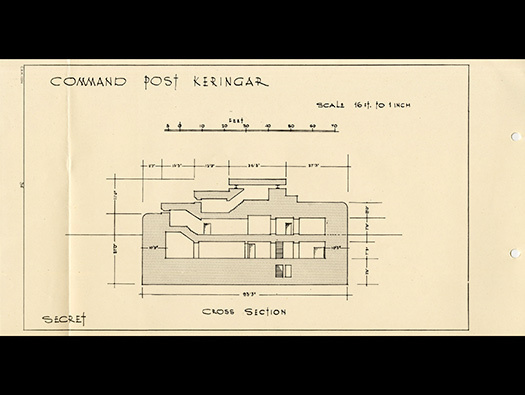 Plan of an M151 quarters bunker for 1 officer, two NCO's & 24 seamen, this bunker was attached to the S414 PDT via a tunnel. Re302 S414 Fire Control Post [PDT] for Bat. 'Graff Spee'. 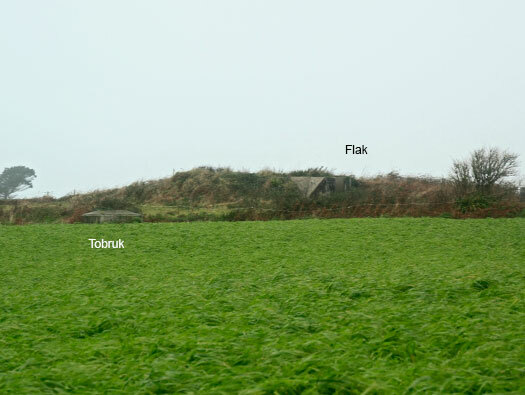 Flak open emplacement and Tobruk. One book states a Flakstellung with a 2cm Flak28 but another says it was a Flakstellung L401A for an 8.8cm gun??? 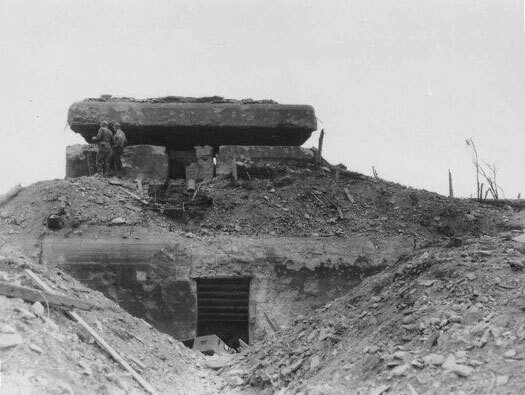 L401A emplacement for an 8.8cm or 10.5cm Flak. 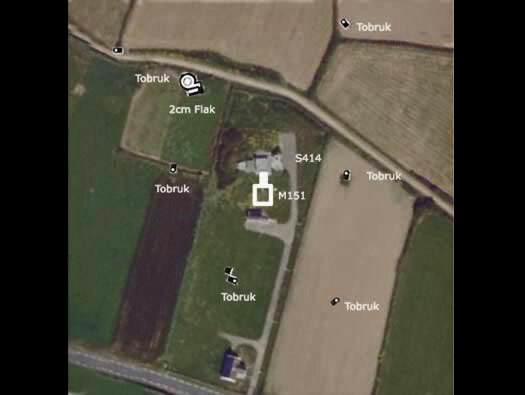 Surrounding the bunker are six Tobruk's, a Flakstellung, the M151 quarters bunker and the S414 in the centre. 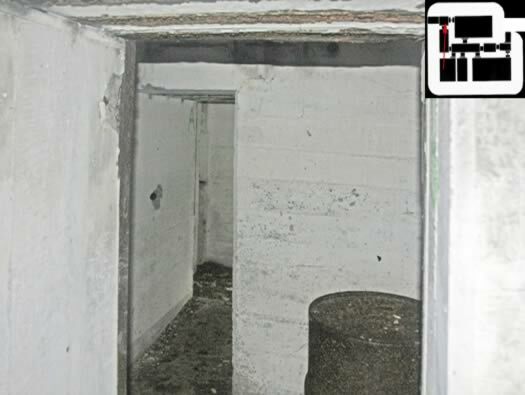 Re303 the main battery site has an M151 quarters bunker in the centre of the battery like the one here. 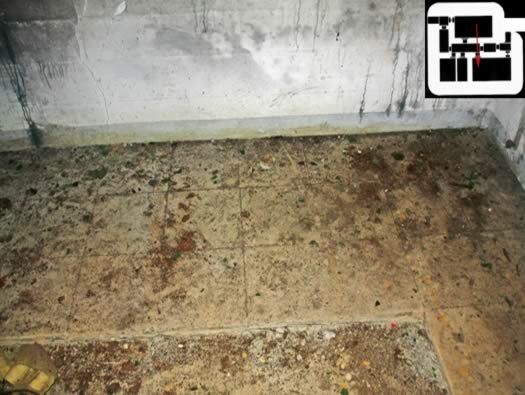 So I have added those pictures to show what it may have look like at the. 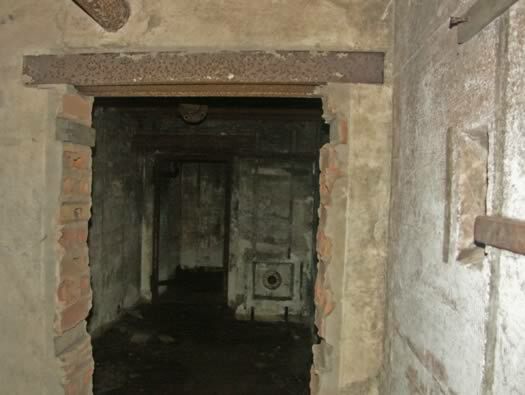 The main picture - is the passage In, with communication cables on the right and two aerial fittings in front and the main door to the left. A telescopic aerial and a radio send & receiver would be set into the slot. 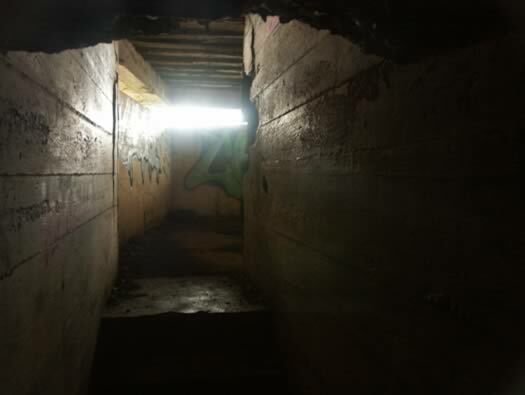 Telescopic aerial in place in a bunker. The floors were tiled to make them a feel a bit more homely but also they helped to cushion the impact of artillery fire on the legs & feet. 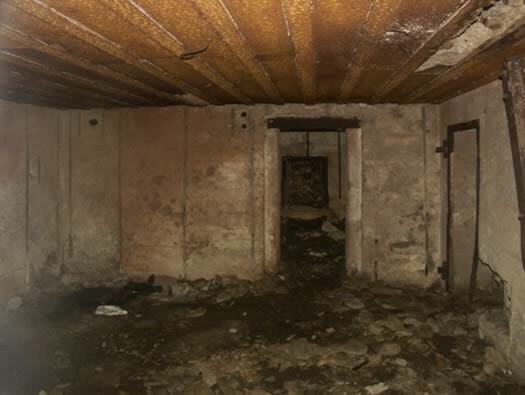 The two larger rooms were for the seamen. 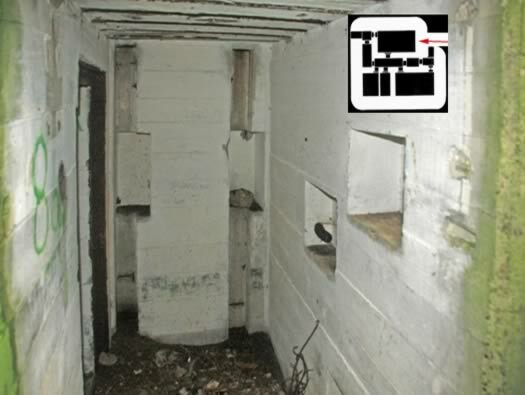 The larger of the two small rooms was for two NCO's and the other for the officer. 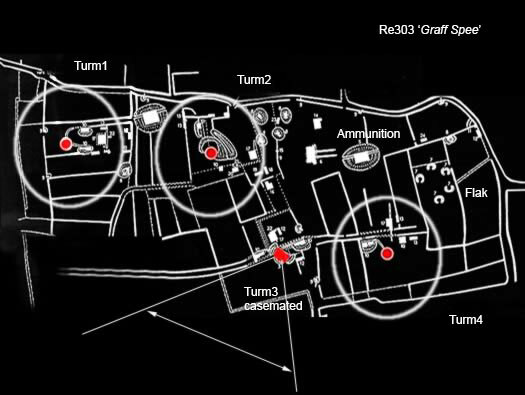 We now go to the fight for BatterieRe303 'Graff Spee' & the FCP. Three of the four 28cm guns could traverse 360deg and instead of attacking sea targets they had to fire on Americans attacking from inland. They said the shells sounded like express trains rushing through the air. Re302 S414 Fire Control Post [PDT] 'Graff Spee'. The Battlefield. 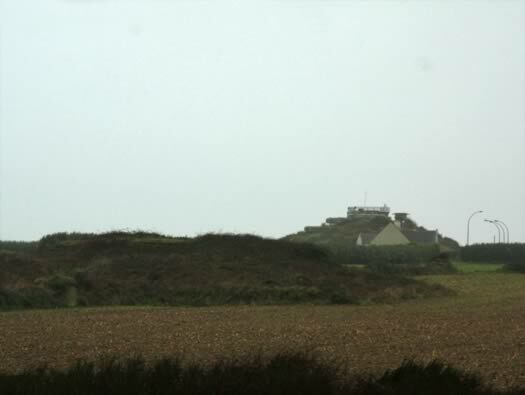 The rangers landed in Normandy on D-Day at Pointe du Hoc. 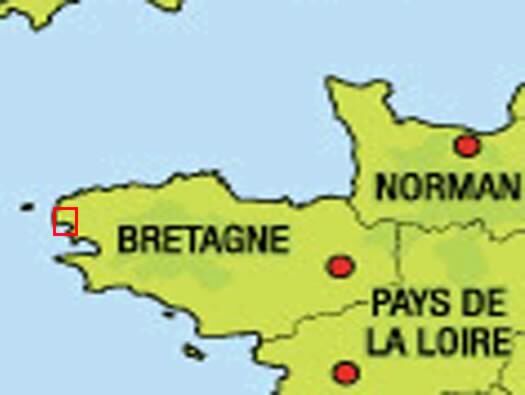 After the breakout from Normandy they were used in western Brittany supporting the 29th Inf. Div. The red arrows are the route they took then attack Re302. 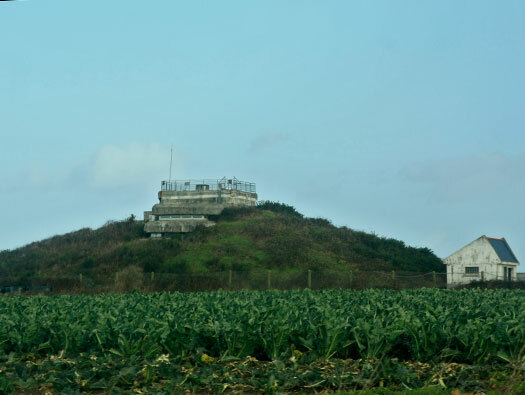 One of their jobs was to clear the fortifications of the Le Conquet peninsular. 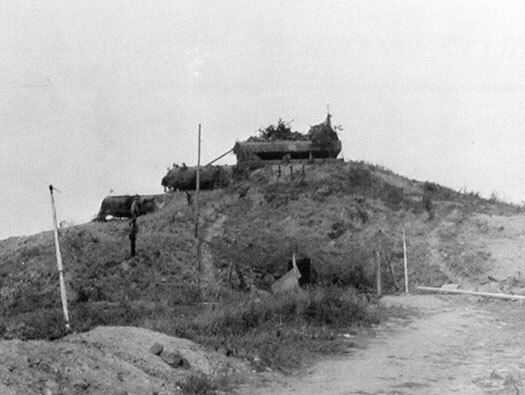 A mixed force of 2nd & 5th Rangers took (I am presuming the Flak bunker ) and then capturing about 40 defenders. How it may have looked after the battle. A room in and S414 in the Gironde. An English speaking German officer took Lt Eldin [left] with three men, crossed a mine field to the main bunker entrance. Leaving two men to guard the rear door they continued inside. 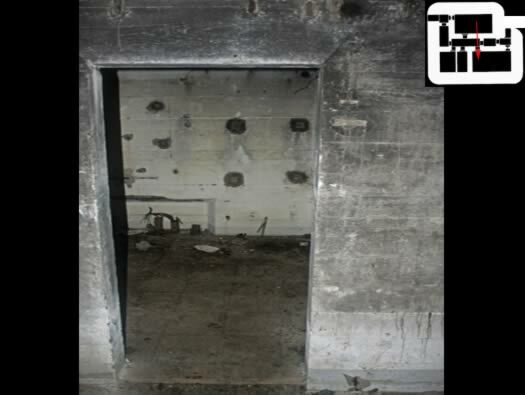 A large bunker entrance door. How it may have looked steps up into the observation room. A room in and S414 in the Gironde. There would be a heavy door here. 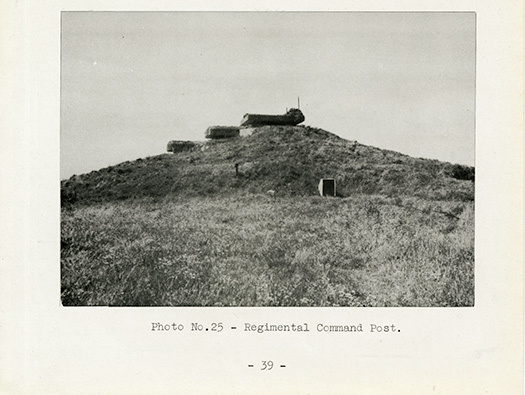 Defence of Brest file HQ 29th Inf. Div. From a pamphlet from the HQ 29th Inf. Div. 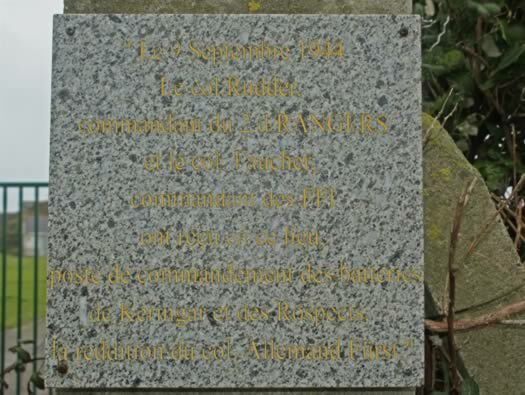 "Le 9 September 1944 Le co Rudder du 2d RANGAERS et le col Faucher commandant des FFI ont recu en ce lieu poste de commandement des batteries de Keringar et des Rospects la reddition du col Allemand Furst." From the 29th Div guest book entry of Col Furst's & it says "Not very happy, Heil Hitler! ".